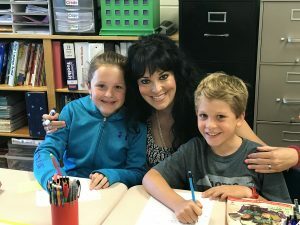 Junaluska Elementary School fourth grade teacher Hayley Prince has been named the 2018-19 Haywood County Schools Teacher of the Year. The annual award recognizes the most innovative and influential public school educators in the county. Prince was chosen out of a field of 15 other educators representing each of the district’s schools. 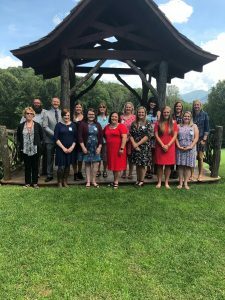 Over the past six years, Prince has taught hundreds of third, fourth, and fifth grade students at Junaluska Elementary School. Prince said she hopes to positively influence her students in a similar way. Each morning, Prince greets her 25 fourth graders at the door with a smile and warm welcome to start the day. Prince’s teaching philosophy is based on each student’s unique learning needs. At the beginning of each school year, Prince gets to know her students and discovers what motivates them to succeed. “By giving my students a safe environment to learn, grow, and succeed regardless of their background, they can set high goals and achieve them,” Prince said. For Prince, establishing positive relationships with her students goes beyond the classroom. It is not uncommon to see Prince at her students’ sporting events, music concerts, or karate competitions on the weekends. She believes these small gestures of showing care and interest in her students’ lives result in greater lifelong success. Prince said she wants her students to go home each day knowing that they accomplished something that will benefit them throughout their whole life. Prince smiled as she recounted a number of students who are now in middle and high school who still keep in contact with her. Education officials praised Prince’s ability to build relationships with her students while teaching everything from North Carolina history to conceptual math. Haywood County Schools Superintendent Dr. Bill Nolte said Prince embodies the passion and dedication of the district’s more than 500 public school teachers. As Teacher of the Year, Prince received a monetary award from Haywood County Schools and will be recognized again in the spring with an Evergreen Packaging award from the Haywood County Schools Foundation. She will also now be considered for the WNC Regional Teacher of the Year award. Over the next year, Prince will act as an ambassador for teachers throughout the county and will serve on several district-wide committees.